The trailer of ‘Saamy Square’ featuring Chiyaan Vikram in the lead was released recently and the film appears to be high on action. Meanwhile, it has been officially confirmed that the film will hit the screens on September 21. Shibu Thameens, producer of Saamy Square has confirmed the same through his social networking page. ‘Saamy Square’ is a sequel the blockbuster cop thriller that released in 2003. 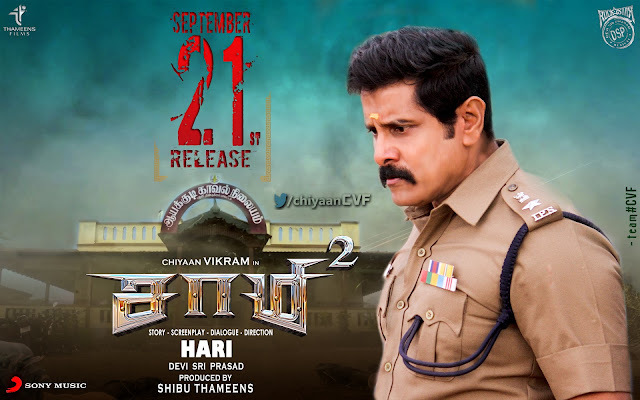 Touted to be a racy entertainer, the sequel will see Vikram returning as the foul-mouthed police officer Aarusaamy. Directed by Hari, the film also boasts an ensemble of actors including Keerthy Suresh, Aishwarya Rajesh, Bobby Simha, John Vijay, Soori, and Prabhu. Going by the trailer, ‘Saamy Square’ appears to be a revenge sage between Aarusamy (Vikram) and Ravana Pichai (Bobby Simha), son of Perumal Pichai. Though the trailer doesn't give out much of the plot, the film seems to be packaged in such a way that it might work with the mass audience. While it was Harris Jayaraj who composed music for the original, the sequel has music by Devi Sri Prasad. The film has been cleared with a clean ‘U’ certificate from the censor board.